Learn how to use this powerful interviewing tool. Editor's note: Unfortunately, Wetoku is no longer available. Lisa Dabbs suggests trying out Skype's side-by-side functionality to achieve a similar result. Since Skype has no built-in recording function, there are a variety of third-party software options you can use. Lisa has worked with Evaer Video Recorder for this purpose, and in this blog post, "How to Create a Split-Screen Video Call Recording on Skype," consultant Danielle Keister explains the process using either Super Tin-Tin for PC or E-camm for MAC. These links are provided for convenience, and are not an endorsement from Edutopia. See the full archive of the five-week New Teacher Boot Camp. Welcome to our fourth week of New Teacher Boot Camp! Today we're going to be exploring Wetoku. Wetoku is a web service or Web 2.0 tool out of Korea that provides a simple platform for interviewing someone via the Internet. Collaborating globally is a must for our students and as result interviewing can be a challenge. Wetoku makes doing an interview as easy as filling out some basic information, creating an interview session and then sending the creative interview session's URL to the interviewee. Once the recording is done, the interviewer can embed the copy of the URL into a blog or website. You will need a web-cam for this tool. 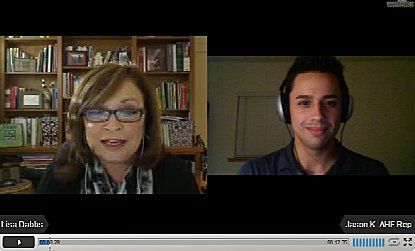 This is a screenshot of an interview I did with my son, Jason. You'll see that your account name, show title, date, time, number of views so far, are displayed on the top of the screen. Your full name and that of your interviewee are also displayed live on the bottom of the screen. It's a great tool, and I've used it with much success! Dave is an elementary school teacher in Turkey teaching EFL (English as a Foreign Language). Take a read about his approach to using Wetoku in the classroom. From Dave: Wetoku's split screen feature makes it perfect for interviews and that's exactly how I used it with my fourth grade English class here in Turkey last year. We had been reading an adapted version of The Wonderful Wizard of Oz and we had a related project about the state of Kansas to do. Through Twitter, I found out a member of my PLN from Brazil had spent time in Kansas as an exchange student and still visited her host family there from time to time. She agreed to be interviewed and I set my students the tasks of preparing questions they wanted to ask. Wetoku was ideal for the interview for a few couple of reasons. First of all, the split-screen feature offered the best visual format. Also, as Wetoku is web-based, we didn't need any extra software like Skype (which isn't installed on the class computer anyway). Finally, the recording is broadcast live (so absent students could still tuned in if necessary) and is immediately archived for future viewing. Once set up, the students took turns to introduce themselves and ask their questions. As English is a foreign language for them, they struggled to understand the answers a little but, as the whole session was recorded, they were able to re-watch it several times later, which gave them some great authentic listening practice! We also made use of the archived interview by embedding it on the fourth grade's English wiki site, thus making it available to the entire year group. The kids really enjoyed having a guest "beamed into our classroom" and got a lot out of the experience! Set up a personal Wetoku account. Follow all the account set-up steps. Explore the Wetoku's that have been created on the site by other users. Practice creating a show alone and/or with a colleague or family member. To create a show start by clicking the blue "Showtime" button on the top of the page. Next decide to do a single show or interview show. For single show click on the "Live" tab and fill in the info. For interview show click the "Interview" tab. Decide on your privacy setting. (May want to do "private" URL feature first, before you go public.) Click the "next" button. Once you click the start button, you will see the red record button on, which means you are recording. Click stop when you have completed your show. When you stop recording, your screen will go dark. (If you have a guest, they will no longer appear on your split screen.) You can now watch the show on your channel. If you interviewed someone, send them the link created, so that they can see the show. Wetoku link can be shared Globally, so don't be afraid to reach out as you practice. Use headphones for your interviews or shows! This will eliminate echo. In this widget menu click "other" -> "other html"
Click Save again and your Wetoku will now appear on your page! Thanks to Dave for the great idea of how a new teacher might begin to explore the use of this great video communication tool! Dave Dodgson works in a private elementary school in Turkey teaching EFL (English as a Foreign Language) in the fourth and fifth grades as well as running the school's wiki pages. He is currently nearing completion of an MA in Educational Technology and TESOL with the University of Manchester. He is an active blogger and you can find him on Twitter as well (@DaveDodgson).